13 Sep 2017 / 11:18 H.
BUENOS AIRES: Israeli Prime Minister Benjamin Netanyahu said Tuesday that the nuclear deal between world powers and Iran should be amended or canceled. Speaking in Buenos Aires alongside Argentine President Mauricio Macri, Netanyahu said he wanted to correct the impression in recent media reports that Israel's position on the 2015 deal had softened. "So let me take this opportunity and clarify. Our position is straightforward. This is a bad deal — either fix it or cancel it. This is Israel's position." 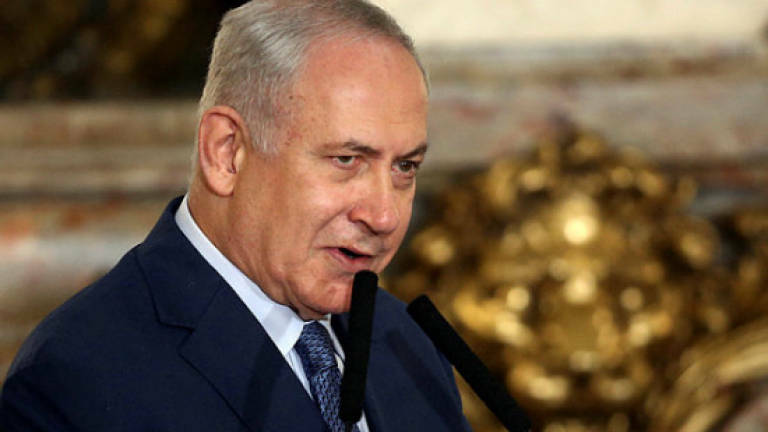 Netanyahu has repeatedly taken aim at Iran since arriving in Argentina on Monday as the first sitting Israeli prime minister to visit Latin America. He accused Tehran of operating "a terror machine that encompasses the entire world, operating terror cells in many continents, including Latin America." "In the case of Iran, it's not only merely terror, it's also the quest for nuclear weapons that concerns us and should concern the entire international community." In a veiled reference to the US and world powers' preoccupation with North Korea, he said: "We understand the danger of a rogue nation having atomic bombs." Macri, who hosted Netanyahu at his Casa Rosada presidential palace, said the visit was "an important step" to improve commercial relations between their two countries. As the Israeli government seeks partners and alliances, dozens of left–wing activists waving Palestinian flags protested Netanyahu's presence in Buenos Aires late Tuesday over his "bellicose and repressive policies" against the Palestinians. Referring affectionately to Macri as "Mauricio, my friend," the Israeli leader said his visit marked the dawn of a new era — "and not accidentally did we begin it here with you." Netanyahu, who is accompanied by a 30–member delegation of Israeli business leaders, said Israel was an "innovation nation" eager to share opportunities with Argentina in agriculture, water, IT, cyber security and health. The two presidents signed a series of agreements on social insurance, streamlining customs arrangements and police cooperation. Macri also presented Netanyahu with some 140,000 historical documents and photographs from before and after World War II in digital form. The documents will enable a deeper understanding of the Holocaust and crimes against humanity, Israel said. On Monday, Netanyahu participated in a ceremony to remember victims of bomb attacks at the Israeli embassy in 1992, and at a Jewish community center in 1994. The embassy attack killed 29 and injured 220, while the community center blast left 85 dead and 300 injured. But some relatives of victims of the 1994 bombing refused an invitation to the event on Monday. "Netanyahu did not come to commemorate the attack, but to increase business," said Diana Malamud, who heads a group called Active Memory. "In these 23 years (since the bombing) Israel has been an observer, like any other country," and did not honestly help "search for the truth" behind the attack, she said. During his stay in Buenos Aires, the Israeli premier was also to meet Paraguayan President Horacio Cartes, who traveled expressly to the Argentine capital for the meeting.